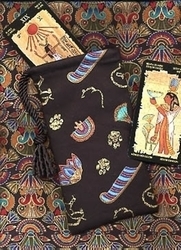 Short Bags - Hieroglyphs Short Bag - Tarot Bags, Tarot Cards, Cloths, & More! 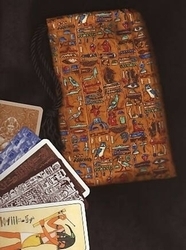 Numerous hieroglyphs, straight from the walls of ancient temples and tombs, form five columns of pictographs on this dark gold cotton fabric. 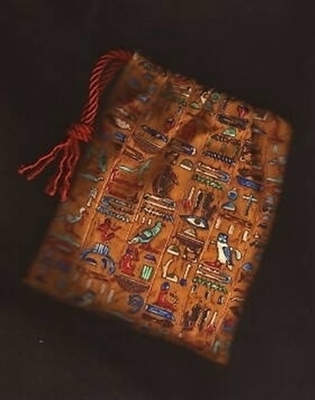 The background looks like roughly hewn stone walls and the symbols and figures include such objects as an all-seeing eye, vulture, owl, quail, reed, leg, arm-hand, servant, seated pharaoh, mouth, basket with handle, horned viper, water, tethering rope, etc. 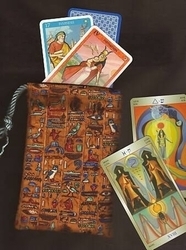 Design: Our single draw bags are classic choice, great for keeping your tarot cards or runes protected. 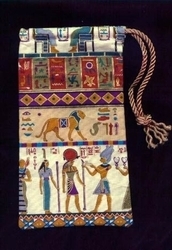 All seams are triple stitched and the drawstring opening is reinforced. See our Quality page for more details about construction. Size: Measures approximately 5" wide by 6" inches tall (12.7 x 15.2 cm). Fits rune sets and most small card decks (2.75" x 4" and smaller).